Green gram is one of the richest sources of protein and it can be used as raw in sathu maavu/baby porridge mix, sprouts can be included in salads, cooked and included in your gravies/kulambu/rice. I have the habit of making dosa with dried green peas ,half split moong dhal and all lentils. The green gram dosa is also called pesarattu and it originates in Andhra Pradesh. Your baby can have it with any chutney post 10 months. 1.Wash green gram to a minimum of thrice and soak it along with raw rice for 8 hours. 2.Drain water completely and rinse in flowing water. 3.Add hing,salt,ginger,green chilly ,soaked dhal and rice in a mixer. 4.Make it into a slightly coarse paste. 6.Add chopped onion and mix well. 8.Heat a dosa pan and grease with oil. 9.Spread it with a ladle into a thin dosa. 10.Cook and steam cook one side by sprinkling oil. 12.Serve it hot with jaggery/coconut garlic chutney. 13.Repeat the same for the remaining batter. You can also add dhal to rice in the ratio of 2:1. You can skip adding rice too. I skipped adding curry leaves and coriander leaves. Adjust chilly according to your taste,since this was made for my baby I added only 1 green chilly. The images were taken on different days. 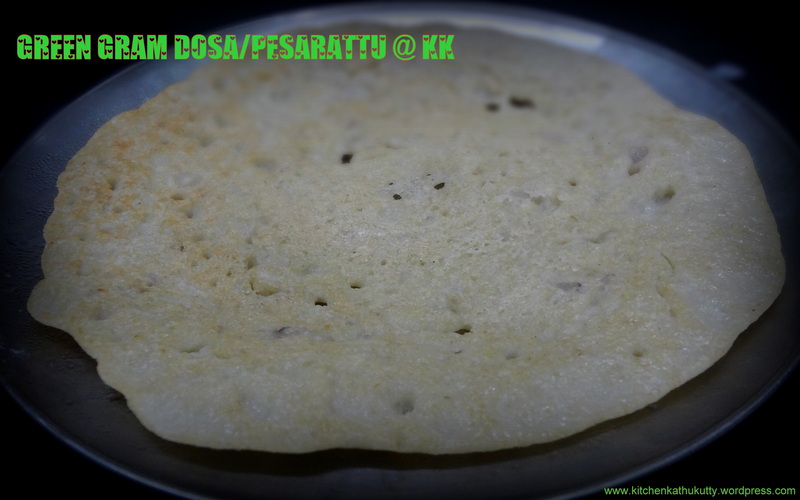 Posted on 14/08/2015 24/09/2015 by Kalyani BalajiPosted in Breakfast & Dinner, Dosa recipesTagged Baby food, dosa varieties, green gram dosa, how to make green gram dosa, how to make moong dhal dosa, how to make pesarattu, lentil dosa, pesarattu.